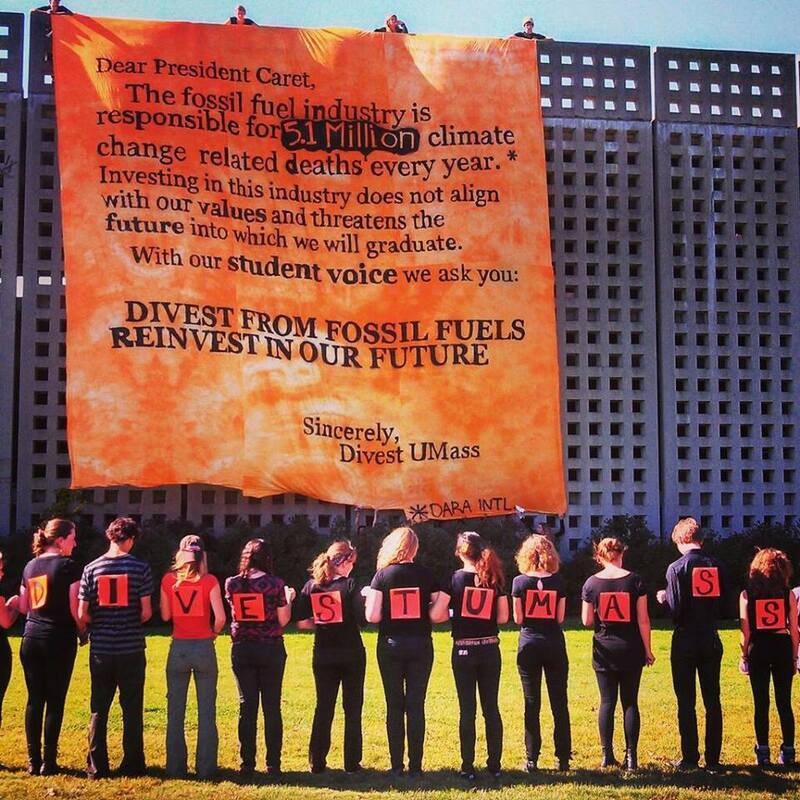 The UMass Fossil Fuel Divestment Campaign was started in December 2012 by a group of students who were concerned about the inaction of large institutions surrounding issues related to social justice and climate change. One of the campaign’s first actions was to meet with campus administrators to discuss the critical issue of fossil fuel divestment. These concerns, unfortunately, fell on deaf ears. After the meetings in the Spring of 2013 failed to produce the actions desired, Divest UMass began reaching out to the campus community to garner support for divestment. This initial outreach culminated in a banner drop from the UMass parking garage in the Fall of 2013. Divest UMass banner drop on the campus parking garage in October of 2013. The following semesters were focused on building support for divestment from students, faculty, and staff. In the fall of 2014, Divest attended the Board of Trustees meeting and held an action, speaking and demanding a vote on divestment, which was ignored. In the Spring of 2015 Divest held actions on Earth day as well as the infamous “whose side are you on?” action at the Board of Trustees meeting. Efforts were spent these semesters on compiling names and emails and making the goals and presence of the campaign known throughout the UMass community. At the September 2015 board of Trustees meeting, students from UMass Boston joined those from UMass Amherst, reflecting the growing support for divestment. Key events that took place in the fall of 2015 were a banner drop at the Millions Students March and a Teach-In event. In December of 2015 the campaign had it’s first big win: the university divested $400,000 from coal. While this is a significant step, it is not full divestment, and Divest attended the December Board of Trustees meeting, this time joined by not only supporters from UMass Boston but advocates from UMass Lowell as well. In February 2016 the campaign had its first ever cross-campus retreat strategy session, bringing together the various UMass campuses in an effort to build support and power. The goal is to create a cross-campus movement and to ideally have campaigns in Boston, Dartmouth and Lowell that are comparable to the strength of Amherst’s campaign in numbers and influence. As the Spring semester progresses, we are escalating our campaign and hoping to achieve our goal of full divestment by the end of the academic year.